Regulation has never been easy. Most of the time, it seems superfluous at best. Most of the time, most of the systems in our lives seem to work. Airplanes get to their destinations, food is untainted, and nuclear power plants hum along. If anything, regulation often seems intrusive--it costs money and it takes time away from other activities. And at worst, regulation can be excessive, or outdated, or misdirected. But the 2 recent accidents involving the Boeing 737 Max 8 point to the fact that trying to skimp on regulation, or allowing the regulated entities to have too much say in how they are regulated and inspected, can have tragic consequences. I am referring, of course, to the crash of the Indonesian Lion Air plane off the coast of Indonesia on October 29, 2018, killing all 189 people aboard, followed by the March 10, 2019 crash of the Ethiopian Airlines flight just after takeoff from Addis Ababa, killing all 157 people aboard. I will be the first to say that I'm not an expert on aviation safety, and that the investigation of the accidents is still underway, so it is premature to draw firm conclusions. However, enough facts have emerged to paint a troubling picture of some of the practices of the Federal Aviation Administration (FAA). Among other things, the FAA had a policy that allowed aviation manufacturers to certify that their own systems complied with FAA's air safety regulations. I don't usually cite comedians, but Trevor Noah, on the Daily Show, captured the issues very well. It is of particular note that the FAA's oversight of manufacturers had been criticized by the Department of Transportation's Inspector General (IG). Among other things, the IG said at different times that the FAA’s system for deciding which technologies carried the highest safety risks was not effective, that those doing the safety checks were not focusing on the potentially high-risk issues, and that the FAA had not adequately trained company employees to spot noncompliance with safety requirements. In its defense, the FAA has sighted its expanding and shifting role, particularly in the aftermath of the 9/11 attacks. Again, I am not the one to pass any judgments on the FAA. But what is striking is that this discussion is playing out in the news at about the same time that the nuclear industry is calling for the the Nuclear Regulatory Commission (NRC) to cut back on their inspections and allow for more self-assessments by the nuclear power plant operators. At the very least, the timing of this nuclear industry initiative is bad. This is not to say that NRC's regulation is perfect, or that there are no ways that that the inspection process could be made more efficient. Not at all. The message is that the two similar aircraft accidents occurring so close together provides a cautionary tale, both for aerospace regulation, and for other types of health and safety regulation. Regulation can always be increased, and it can always be decreased. And I'd be the last person to say that the NRC, or any other regulatory organization, has found the perfect balance. But any changes need to be considered carefully. If self-assessments replace some of the current inspections, how will NRC assure that the utility people involved in the assessments are properly trained and that they are conducting the inspections appropriately? How will NRC review or check on the results? How will the public be assured that the same standards are being met? Regulation should certainly be open to internal change. Some changes may be spurred by technology changes, some by the identification of new risks, and some by the interest in improving efficiency and effectiveness. And there can be a role for industry self-assessment. But, as the recent aircraft crashes so dramatically and so sadly suggest, there can be a serious downside to insufficient regulatory guidance and oversight. The NRC has usually been very careful in its decisions on what and how to regulate. In this time of heightened awareness of the tragic consequences that appear to stem in part from insufficient oversight, the NRC should be particularly sensitive to how it implements any changes in its inspection processes. Late last October, I had the opportunity to visit Fukushima in conjunction with a conference I was attending in Sendai, so when my personal plans this month called for a stop in Kiev, Ukraine, I just had to find a way to get to Chernobyl. Since I wasn't traveling on official business, I looked for other ways to get there. 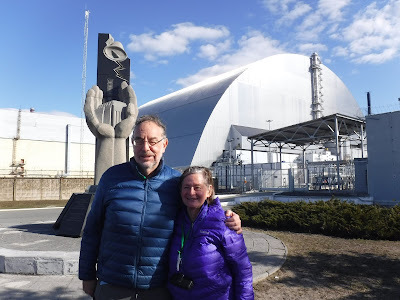 This would lead me to the first observation of many that I had in the course of visiting these two sites within a 5-month period: There are currently no public tours of Fukushima, but there is a thriving business providing commercial tours to Chernobyl. So my husband and I booked a one-day tour from Kiev to Chernobyl and back. Departure time was 8, but by the time we got to the departure point at 7:30, we noticed that there were several buses and that lines were already forming outside the buses. We were directed to one bus, where we got in line to be checked in. The paperwork included showing our passports so they could be checked against the information we had provided in advance. We also had been offered an option of renting a Geiger counter, so the numbers of the devices needed to be recorded as well. We ended up with a full busload of 46 people from 13 countries, but I discovered we were only one bus of several making the trip that day. The guide also told me this was off-season, and they had more tourists in the summer months. The trip from Kiev to the exclusion zone around Chernobyl took roughly two hours. At the first checkpoint, the tour group underwent a check-in procedure, the primary purpose of which was to try to make sure that they knew who is going in and coming out. And to make sure the people who go in do come out. We were also issued thermo-luminescent dosimeters (TLDs), whose numbers had to be entered in the roster next to our names. After the checkpoint, some of the members of the group spotted an elk standing by a body of water off the side of the road. Other than that, the only animals we saw were dogs that hang around at the checkpoints and the entrance to the cafeteria. We were warned not to touch the dogs, so I didn't, but these didn't look like wild dogs. They were clean and look well-cared for. The first stop on the tour was a small, abandoned village called Zalissya. I had never heard of this village, but we stop here because they allow us to go into some of the buildings, something they don't allow at the other stops. The village had scattered one- and two-story houses and a few other buildings, such as a school. We walked down the main road and poked our heads into one of two of the homes. After 30+ years of neglect, they are falling apart, and we had to pick our way around some damaged floorboards, and pieces of walls and ceiling that have fallen down. We then go through a second checkpoint at Leliv and detour from the main route to see an old Soviet missile defense early-warning radar site called Radar Duga-1. This is one of the sites that emitted a sharp tapping noise that caused it to be dubbed "the Russian Woodpecker." Our next stop was Kopachi, where we went into an old school building that had child-sized cots. A couple of the cots had dolls sitting on them. Our guide pointed out some spots outside the building where there are high radiation readings, and everyone had a chance to see the numbers on their Geiger counters spike. We then circled around the Chernobyl nuclear power plant site, where we saw the sarcophagus, the other now abandoned units, and the skeleton of a new unit that was under construction when the accident occurred. From there, we went to the cafeteria for the workers, where we had a quick lunch. Entry into the cafeteria requires going through a scanner to make sure no one tracks radioactive particles into where the food is being served. Following lunch, we returned to the buses and were taken to a closer point to view the sarcophagus. The current sarcophagus replaces the earlier one and still looks new and shiny. We were able to take selfies with the sarcophagus in the background, but we were warned not to take pictures of some guards we see off to one side, or to take pictures in some other directions, in particular, of the fuel storage facilities. After that, we finally reached Pripyat (also spelled Prypiat), where we got off the bus and took a long walking tour through the town. For safety reasons, we were admonished not to enter the buildings, many of which are missing most of the walls and windows on the ground floor. (Scrap aluminum was apparently valuable in the Soviet Union, and window frames were stolen.) Of course, in their eagerness to get some pictures, some people kept ignoring the instructions, and the tour guide spent much of her time trying to corral the group. Pripyat has been built to house the staff of the power plant, and is much grander than the little village we had visited, with multi-story buildings and a lot of infrastructure--administrative buildings, schools, post office, supermarket, recreational facilities, etc. The tour ended at the stadium and amusement park that had just been built and had not even officially opened at the time of the Chernobyl accident. This site boasts what is allegedly the hottest spot in the exclusion zone, and everyone had a chance to check the reading with their Geiger counters. After we got on the bus and got underway again, we passed an area of high radiation. The tour guide told us to put our Geiger counters against the window, creating a small "chorus" as they all went off at once. Our last stop was the town of Chernobyl. On our way in, we paused briefly at a monument to the liquidators of Chernobyl. It is sited just outside the firehouse from which most of the firefighters came, but the statues surrounding the monument also represent doctors and others who were involved. The statue is titled, "To those who saved the world." While Chernobyl (or Chornobyl) is still in the evacuation zone, and no one lives there permanently, it is now used to house people who are working at the plant. They work in 15-day shifts and spend their time off in Chernobyl. The utility pipes are laid out in an unusual way--they are all above ground, and they are raised over walkways and roads. The reason is that digging to bury them would release radioactive particles that have sunk into the earth. Exiting the exclusion zone requires going through the same 2 checkpoints we hit on our way in. We each went through a scanner at each stop. Apparently, the second one was more sensitive than the first. And the bus also got scanned at each stop by a hand-held scanner run under the bus. The tour guides also read our Geiger counters and gave us each a certificate showing the radiation dose recorded. Mine was 0.003 mSv, and my husband's was 0.002 mSv. With the 2-hour trip back to Kiev, the total tour is more than 12 hours. - The 2 sites are at very different places in their recovery from the accidents. The Fukushima accident was only 7-1/2 years ago when I visited the site. The Chernobyl accident was almost 33 years ago. This difference may account, at least partly, for some of the other differences I note. - At Fukushima, the damaged units were still exposed. At Chernobyl, the damage is concealed under a sarcophagus. - The Fukushima tour spent more time on the power plant site, where we looked at where they were storing water, etc. On the other hand, we just drove past the residential and business areas. The Chernobyl tour didn't spend much time on the plant site, but did give us a close look at the residential areas. - Most of the housing and other buildings outside the site at Chernobyl is badly damaged by 30+ years of neglect and vandalism. The housing and businesses on the roads outside the Fukushima plant mostly appear to be in good shape. - You are allowed to drive through the exclusion zone around Fukushima with no checkpoints--although you can't stop. You are not able to drive through the exclusion zone around Chernobyl. - There are no public tours of Fukushima. Chernobyl has hundreds of visitors a day. - Photography was not allowed at Fukushima. Cameras and cellphones were collected before the tour and returned afterwards. One reason was so that the accident would not become a spectacle. Photography was permitted at Chernobyl, although photography was restricted in some areas, and souvenirs were available for purchase at the end of the tour. - Our guide at Fukushima was a technical person. The guides at Chernobyl were not experts in the field. They are pretty knowledgeable, and basically did a good job, although I caught a couple of questionable statements. Overall, I learned more from the Fukushima tour, where I got a close look at some of the technical work in progress. However, getting a tour of Fukushima is just not an option for most people. The Chernobyl tour gave a different perspective, and represents the post-accident situation at a different point in time, with more of a focus on the civilian side. And the tour is available to the public (for a fee, of course, but one I thought was reasonable). While I wouldn't recommend planning a trip to Chernobyl as your next vacation, for anyone who is traveling in the area, it provides an interesting experience. (I'm not in the business of advertising for commercial businesses in this blog, but we found this tour operator on the Internet, and checked it out by looking at on-line reviews on one of the major travel sites.) And having had the opportunity to see both sites within a short period of time really provided a very special perspective. For a long time now, I have been harping on the point that the sun and the wind may be free, but collecting it and using it requires resources and produces wastes. That is not to say that solar and wind energy are bad, but just that the impacts need to be understood and considered when making decisions on energy alternatives. Therefore, I was glad to see several recent articles that recognized the same thing. The first was actually a news item in the Daily Caller from last August that I just recently saw, reporting on solar panels catching fire in an apartment complex in Holland. This in itself illustrated an issue that isn't often discussed--that there are some safety risks associated with all technologies, including solar and wind technologies. But of more interest was the fact that the article went on to discuss other potential issues associated with solar power, including a report by Environmental Progress, a group led by Michael Shellenberger, claiming that solar panels create 300 times more toxic waste per unit of electricity generated than nuclear power plants. While I haven't seen the study and can't vouch for the exact numbers, I have long been concerned about the need for heavy metals in the production of solar panels. The Daily Caller article goes on to say that Japan is already experiencing problems in dealing with the growing amount of waste from solar panels. The same week, I came across an article from a group called Interesting Engineering that addressed the question of whether storing waste at Yucca Mountain is a problem. This article mainly addressed the nuclear waste problem, but in the context of the discussion, included the observation that renewable technologies, like wind and solar, also require raw materials and energy to produce the wind turbines and the solar panels. The article includes a brief comment that solar and wind are "not completely environmentally friendly" during their lifetimes. Clicking on the link on that comment brought me to pages posted by the Union of Concerned Scientists that in turn had links to the pages on the environmental impacts of each technology. While these analyses were not qualitative and may not cover everything, they mention many of the same points that have been on my mind. It has taken a long time for the euphoria over "infinite" amounts of "free," "clean" solar and wind energy to be tempered by reality. The reality does not negate the fact that solar and wind can and should be part of the future energy mix. It does, hopefully, start a dialogue that will lead to actions to be sure that the negative aspects of every technology are recognized and addressed from the start of the planning process for new energy systems, and that decisions are made based on a complete understanding of all the pros and cons of a technology and its alternatives. A recent report by the OECD Nuclear Energy Agency provides an analytic assessment of something that has been discussed for a long time--that there is a significant system cost to relying too heavily on intermittent renewables. The report models different levels of nuclear power and renewables with a tight carbon emission constraint. Since the load factor of variable renewable energy (VRE) sources is much lower than that of conventional fossil or nuclear power plants, a significantly higher installed capacity is needed to produce a given amount of electricity. The results of the study are consistent with observations in countries like Germany, where, despite declining generation costs and zero marginal costs for solar and wind power, the costs of electricity have risen as more renewable energy has been supplied to the grid. The study also points to other issues. For example, deploying a lot of wind and solar power with low marginal generating costs produces a significant increase in the volatility of electricity prices, which can have negative financial implications for both backup sources of electricity and for the renewable sources. One might question the credibility of a study on renewables from an agency that focuses on nuclear power, but one should keep in mind that the mission of the OECD/NEA is NOT to promote nuclear power. Its mission is to assist its member countries in developing the bases for the safe use of nuclear energy. In fact, the membership of the OECD/NEA includes countries that are anti-nuclear, e.g. Ireland. So, based on my experience there as Deputy Director-General in 2004-2007, I can assure readers that any comparison of energy sources that shows a benefit for nuclear power would get careful scrutiny from the anti-nuclear members. Therefore, the results of this study should be taken seriously as countries try to move away from carbon-emitting energy sources, and should be viewed as another indication that a balanced portfolio of energy sources is essential in the future. I was surprised yesterday to see in one of my emails an article published on January 20 in The Atlantic entitled "Why There Are No Nuclear Airplanes." I have some personal history related to the concept of nuclear-powered aircraft, so this brought back some memories. As it turns out, the concept of a nuclear-powered aircraft has been considered at least twice. This article recounted the first efforts to develop nuclear powered aircraft, starting in the late 1940s and continuing through the 1950s. This was by far the larger effort, and certainly the one that should receive the most attention. However, there was a second effort in the 1970s that was much more limited and is much less known than the first initiative. The Atlantic article didn't cover the second wave at all. Although the second effort was shorter lived and never got beyond the very early planning stage, I thought it might be worth completing the picture by describing that effort. But first, to recap the original program. As The Atlantic article indicates, the 1950s concept for a nuclear-powered aircraft focused on supersonic aircraft that could stay aloft for long periods and wouldn't need refueling. The payload capacities of the aircraft at that time, however, posed a number of limitations. On the plus side, they led to the early R&D efforts on molten salt reactors, which had the ability to achieve a high power density. However, even with the high power density, the plane could not carry the additional weight of a fully shielded reactor. Therefore, the concept involved an unshielded reactor, and the pilots would have been subjected to high levels of radiation exposure. The program was ultimately cancelled in the early 1960s. By that time, the development of ballistic missiles, mid-air refueling, and longer range jet-fueled bombers largely filled the niche that nuclear-powered bombers would have filled. Fast forward another decade or so. With my freshly minted doctorate in nuclear engineering, I ended up working for Analytic Services Inc. (ANSER), a company that worked mainly for the Air Force. When I was hired, I was told that I'd work on a variety of issues, but I would be the source of expertise within the company whenever a nuclear-oriented project came up. Although that sounded intriguing, I wondered at the time if I'd ever see such a project. I didn't have long to wait. Shortly after I arrived there, ANSER was asked by the Air Force to do a study on a concept for a nuclear-powered aircraft. This concept was much different than the earlier effort. The need now was considered to be for an aircraft that could stay aloft for long periods of time for purposes such as command and control. Thus, it would only need to operate at subsonic speeds. It would also take advantage of the latest in both aircraft and nuclear reactor technology. And the concept I was to analyze definitely called for the reactor to be shielded. Well, that analysis showed that even with the larger aircraft that would be used, the weight of a shielded reactor would leave no allowance for any payload. That alone doomed the concept in this second round. (And there was no longer any consideration of exposing flight crews to an unshielded reactor.) In addition, this was the period where public concerns about the safety of nuclear power plants were beginning to emerge, and the anticipated public resistance to the idea of flying reactors over the country also dampened the enthusiasm for this project. So this time, the effort was limited to a paper study and to briefings and discussions with representatives from key Air Force and other organizations that would be likely to participate in such a project if it were to move forward. No funding was ever allocated, and no R&D was ever initiated. Thus, it is only a footnote in history. Nevertheless, it is of interest to those who follow the history of nuclear power, and it is a reminder of how some concepts can be revived in different guises as technology develops and needs evolve. At the time I did this work, much of it was classified, but when I tried to see if anything was now publicly available, I came across this very comprehensive study, which I can recommend to anyone who wishes to learn more about the brief renewed attempt to develop a nuclear-powered aircraft. 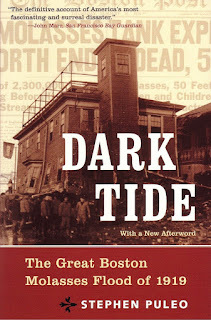 I was reminded this morning that today is the 100th anniversary of a lethal accident in Boston involving--yes, molasses. 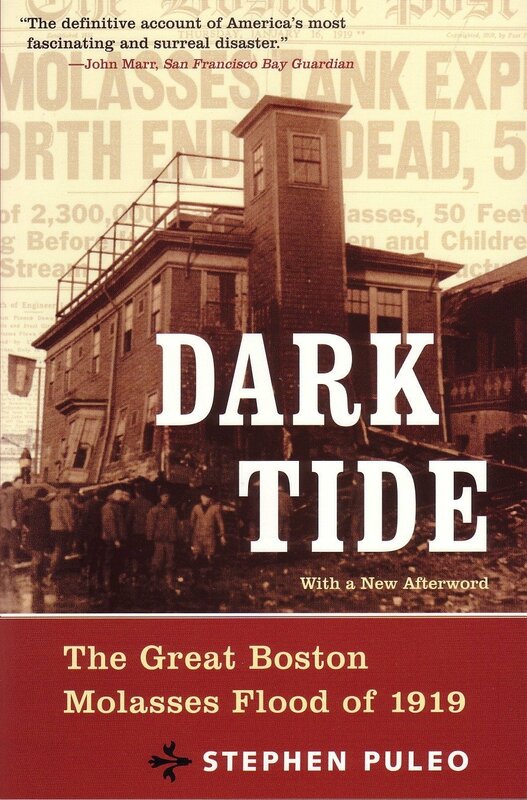 The Great Molasses Flood of 1919 may sound quaint and silly today, but was, in its time, a significant accident that triggered changes in construction requirements and laws requiring professional certification of engineers. This sad anniversary reminded me yet again of how rules and regulations, onerous as they may seem, often trace their origins to the tragedies that occurred in the days before society realized the dangers of some of its activities. I have written previously about the Triangle Shirtwaist Factory Fire of 1911 and the ensuing developments in fire codes. And both of these historic events, as well as others, always make me reflect on how we can anticipate the potential for accidents as we develop and deploy new technologies and put the right preventive measures in place before anything happens, rather than after. It seems to be an issue that arises in every area of human endeavor. After all, who would have imagined that molasses might cause such a deadly accident? Today, we face other technological developments that raise similar questions: What are the potential risks from driverless cars? How can we assure that GMOs are safe? Is fracking a miracle development to extract more fossil fuels from the earth, or are we going to trigger earthquakes? The nuclear power industry has long grappled with such questions in relation to the use of the atom, and some of the techniques developed to analyze different nuclear accident scenarios, such as probabilistic risk assessment, have been adopted by other industries as well. That is not to say that the nuclear field has all the answers. Indeed, the issue of risk from technologies seems to be a continually evolving one. Population growth in an area, rises in sea level, changes in weather patterns, competing societal requirements, and more all affect the calculation of risk from nuclear power, as well as from other technologies. And the answers are never simple and never perfect. Some answers require costly systems to prevent or mitigate accidents, or siting restrictions, or other constraints. And we continually seem to discover new issues, or new aspects of issues we thought we understood. These are not issues that can be resolved in a blog. But the fact that this is the anniversary of an event that sparked a lot of change in its time does deserve mention in a blog on nuclear power issues. At a minimum, it reminds us that society has dealt with the issues created by "new" technologies (or, perhaps in the case of molasses, a growing industry) for a long time, and it gives me hope that we will continue to do so with the technologies of today. One of the early chapters in the history of nuclear power is about to enter its final phase. The N.S. Savannah, which was built as part of the Atoms for Peace program started by President Eisenhower to demonstrate peaceful uses of atomic energy, became the first nuclear-powered civilian cargo/passenger ship when it was put into operation in 1962. It is currently being readied for decontamination and final disposition. The ship was operated until 1971, and the fuel rods were removed from the reactor core a few years later. It has been maintained in that state, and in recent years, has been berthed in Baltimore Harbor awaiting a final determination of its fate. The US Maritime Administration (MARAD) has maintained it, and over time, has even restored portions of the public areas of the ship. However, this has always been regarded as a temporary state. The decontamination process is triggered by the fact that the ship still holds a license from the U.S. Nuclear Regulatory Commission. That license expires in 2031, and by law, decommissioning should be completed before the license expires. Decontamination is the first step in the decommissioning process, and expected to take several months. For those who are interested, there is a great virtual tour that takes you to a number of locations on the ship, including around the outside of the containment (before the containment was opened). The website also has more information on the history of the ship. In the meantime, the ultimate disposition of the ship is still under consideration. MARAD and a number of other interested organizations are actively discussing the next steps. Possibilities range from preservation of the entire ship to scrapping the hull and preserving only a few key components at a museum or other facility. Obviously, everyone is hoping the ship can be saved intact, but that depends on it finding a suitable home. I would be happy to pass on any offers to host this historic ship!